Russian economy has passed the toughest part and a collapse isn’t expected, as its strengthened fundamentals won’t undermine the country’s stability, said President Vladimir Putin. “The fundamentals of the Russian economy have strengthened and the stability cannot be destroyed completely," Putin said Tuesday at the All-Russian Popular Front media conference in St. Petersburg. He added that overcoming the difficulties of 2014 was one of the greatest achievements in recent years. Speaking about the events the Russian economy faced at the end of last year, such as the oil crisis, Western sanctions and a steep fall in ruble exchange rate, Putin said they were certain complexities that he wouldn’t even call a crisis. However, they left a mark in the country’s economic outlook. "This does not mean that everything will start flourishing instantly. Maybe we'll even feel the aftershock of the end of last year,” Putin said. "However, it’s already clear that there is no collapse and none is expected," he added. Putin hopes it will be possible to stabilize the situation in the short-term, and develop it further. He said that the most important thing is not the oil price but the strengthening of the Russian economy’s fundamental principles that won’t create instability. Talking about the domestic economy, Putin said that the manufacturing levels are still lower than expected and the wage rises outpaced the growth in productivity. "I expected production to continue growing, but, unfortunately, this failed. Still, it must be achieved," he said. However, the overall domestic economy has greatly strengthened during the recent decade. GDP grew by 15 times in nominal terms, and pensions and salaries have grown 20 times, the president said, adding that the real income of the population has also grown many times. 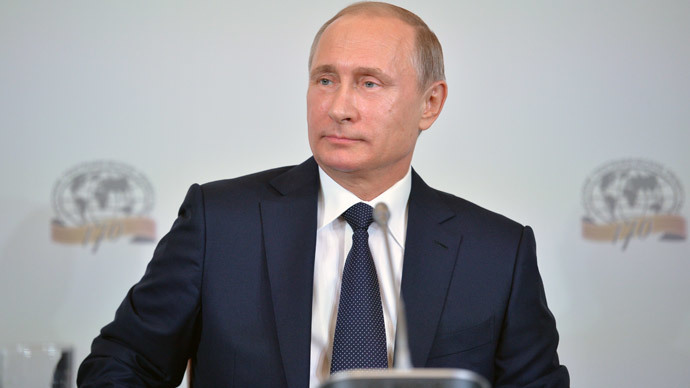 Putin also outlined the basic goals the country’s economy should achieve in the near future. "The primary task for today is to increase in economic sovereignty and the development of our economy as high-tech and high-performing. I am sure that we can do it."